Forest Park Forever Park Ecologist Amy Witt led a group of over 100 into a section of the Park's Nature Reserve on Saturday, October 28. Everyone who was there signed up to do their part to make Forest Park healthier by removing unwanted and invasive species. In this blog post, Amy provides a recap of the event and explains some of the benefits of doing this kind of conservation work. Amy Witt gets everyone ready to remove some honeysuckle. 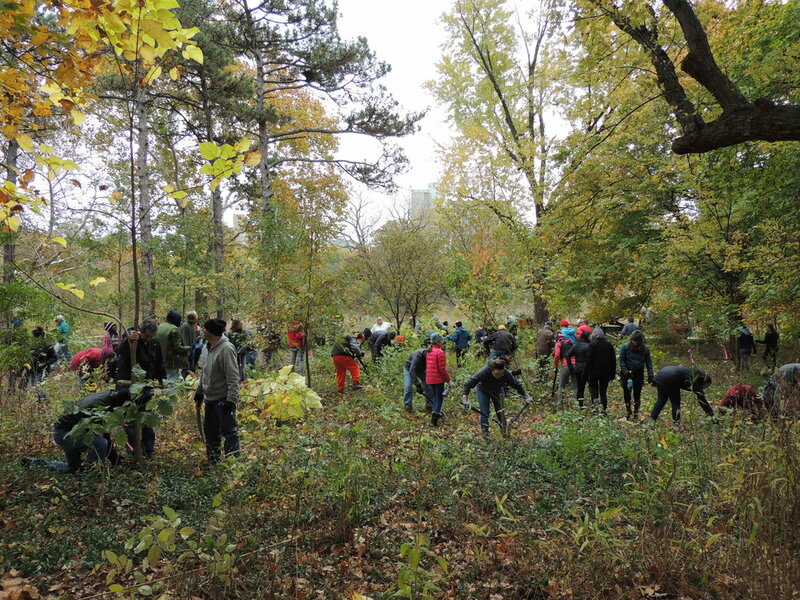 On a chilly Saturday morning, the Forest Park Forever team was joined by over 100 volunteers for the Park's 19th annual Honeysuckle & Invasive Species Removal Day. Some of the volunteers were seasoned environmental stewardship warriors bringing their hand saws, knowledge and worn hands. Others were new to this kind of restoration work, excited to learn firsthand how to help create healthy natural habitats. The area in which the group was working sits just northwest of Steinberg Skating Rink – a 1.7-acre woodland/savanna. 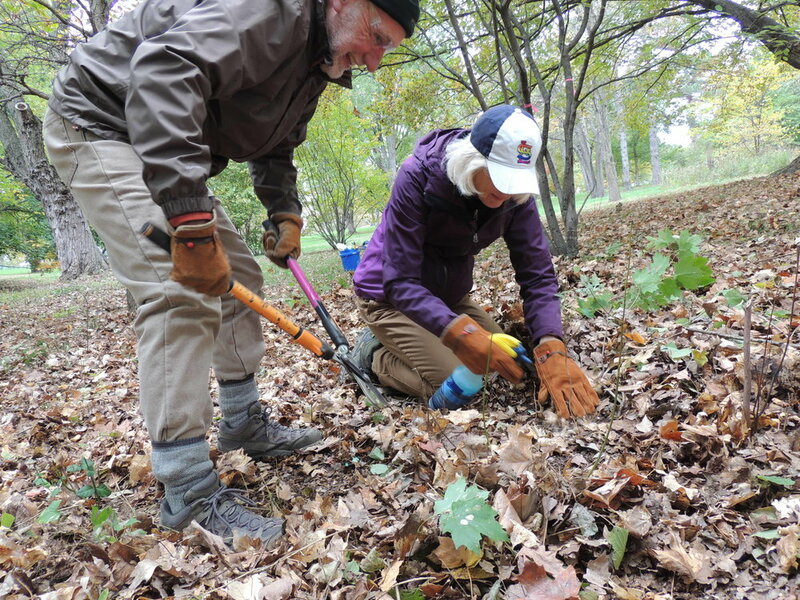 This was one of 19 sites participating in the annual Honeysuckle Sweep for Healthy Habitat, a regional campaign organized by the Missouri Botanical Garden. 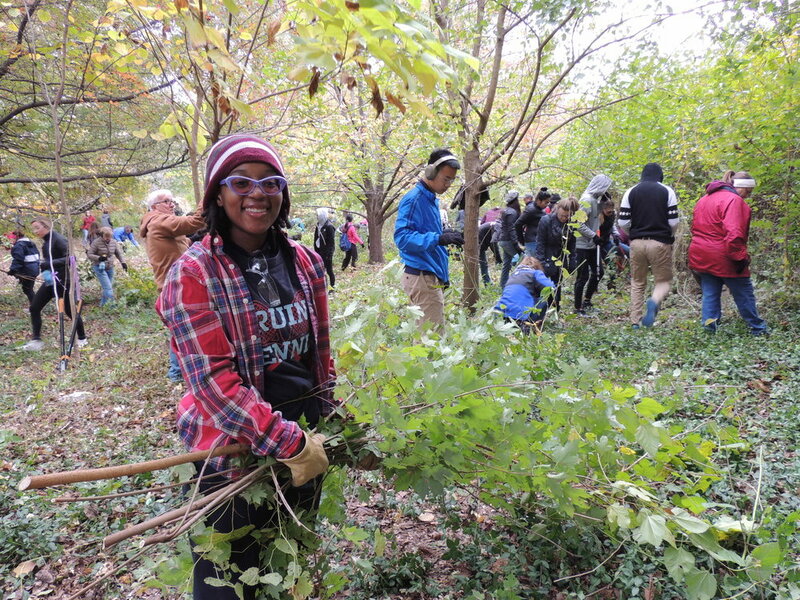 Volunteers diligently removed invasive, non-native and aggressive woody species such as bush honeysuckle, white mulberry, Bradford pear and silver maple. The dense thicket that first greeted the group was reduced to 10 dump truck loads of wood chips. As the before and after photos above demonstrate, native trees once hidden will now receive additional nutrients and sunlight to support their continued health and vigor. These efforts support the continued conservation efforts and long-term goals of the Nature Reserve team. In the last year, the east side of the Park has received increased conservation attention. Three acres of turf grass just south of the Hatcheries was reconstructed into what is now called Hatcheries Prairie. Round Lake Vista, three acres of woodland/savanna just northwest of the project site, underwent an intense restoration process producing one of the Park's best woodlands to visit in the spring. Buffers along the waterway are actively being restored as part of our Nature Works program. These sites' continued restoration will not only increase the Park’s natural ecosystems, but will enhance the sustainability and success of all the natural habitats within the Park. Environmental conservation in Forest Park is a continuous process that is only able to progress with the help of the surrounding community. 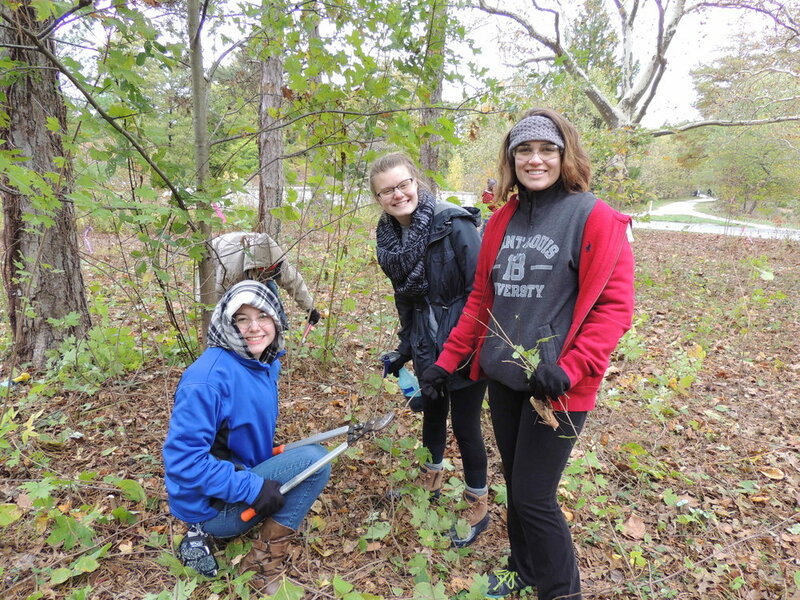 We are continuously thankful to our supporters who help steward the natural areas in Forest Park through their eager hours of volunteer work and continuous financial support! It is through combined stewardship that a healthy, more diverse ecosystem is possible.